Posted on 4/8/2019, 11:16 am, by kittykill, under General Projects. 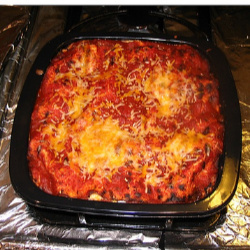 Looking for a light alternative to a heavy lasagna? Why not try HSG’s recipe for Matzah Lasagna. This dish is full of possibilities not only for Passover, but any time you are craving pasta. Using cottage cheese will make this dish even more low cal, so you won’t feel bad not sharing and eating the entire pan yourself. Also, with matzah crackers you can make single serving size or enough for just two. The recipes on our Cooking Board will inspire you to try something new. Who knows, you might find your new favorite dish! Happy Monday!